Descendant of one of the most prominent families from Brescia, the younger son of the Earl Gianmaria, Federico was born in 1747. He studied in Rome, showing even in those early years his passion for riding horses. Dating back to that period, is a letter he addressed to his father complaining that, due to riding continuously, all of his trousers were consumed. He then prayed his father to give provision to the leather dealer to bring different sets of trousers in black leather. At a later age he was an ardent Jacobin, so that in May 1794, he was arrested leaving the city theater, on charges of having participated to political meetings. Together with Carlo Arici (who called himself ex-noble), Mazzucchelli was in fact the most resolute leader of Jacobin coterie, which met in Brescia in the circle named Good Friends. He was sentenced to remain imprisoned in the Castle of San Felice until the end of September. The prison, however, did not discourage his political passion. Three years later, while Napoleon was approaching, he signed as chairman of the Supervisory and Police Committee, a proclamation to all peoples of the free Italy, in which was extolled the unity of an Italian Republic, that the naive young noble hoped would be realized with the help of Bonaparte. The story would soon completely disillusion him. He resigned from all political functions and returned to his beloved horses. 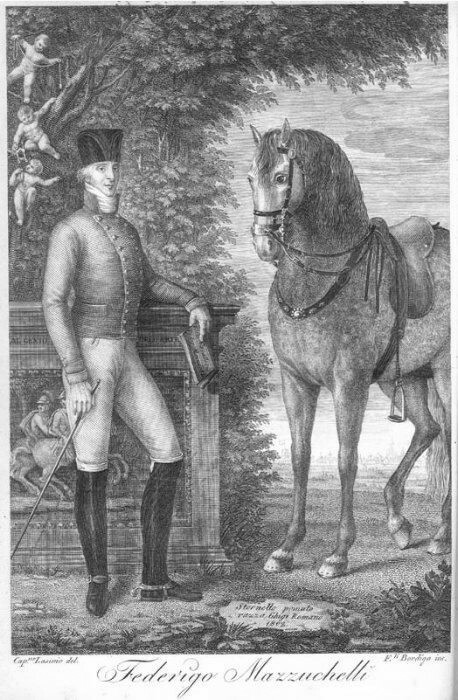 In 1802, he published in Milan, a work entitled Elementi di cavallerizza (Elements of Riding), then reprinted and expanded in 1805, with the title of Scuola equestre (Riding School), with beautiful copper engravings representing the riding exercises, carried out by the workshop of the brothers Bordiga, from the designs of Basilio Lasinio.He died in 1805. Even his death was in the sign of equitation since, as it is written in his obituary which appeared in the “Giornale dell’Italiana Letteratura” (Journal of the Italian Literature) of Padua, that he died while he was riding: «Passionately devoted to his art, he died in the very act of exercising it, since being hit by a fierce apoplectic accident while he was riding, he left the life in the same riding arena in January 28, 1805, with pain of his friends and of every educated person that knew him». (ANONYMOUS, 1805, p. 282.). AGLIARDI, Danilo, La famiglia, in AA. VV., Villa Mazzucchelli. Arte e storia di una dimora del Settecento, Cinisello Balsamo, Silvana Editoriale, 2008, pp. 11-47. ANONYMOUS, Necrologia: notizie di Federico Mazzucchelli, in “Giornale dell’Italiana letteratura”, Volume 10, 1805. pp. 281-282. FILIPPINI, Nadia Maria, Donne sulla scena politica: dalle Municipalità del 1797 al Risorgimento, in AA. VV., Donne sulla scena pubblica: società e politica in Veneto tra Sette e Ottocento, a cura di N.M. Filippini, Milano, Franco Angeli, 2006, pp. 81-137. PECO, Luigi, I Bordiga: Benedetto e Gaudenzio Bordiga, incisori e incisori-cartografi, Borgosesia, Valsesia Editrice, 1998.